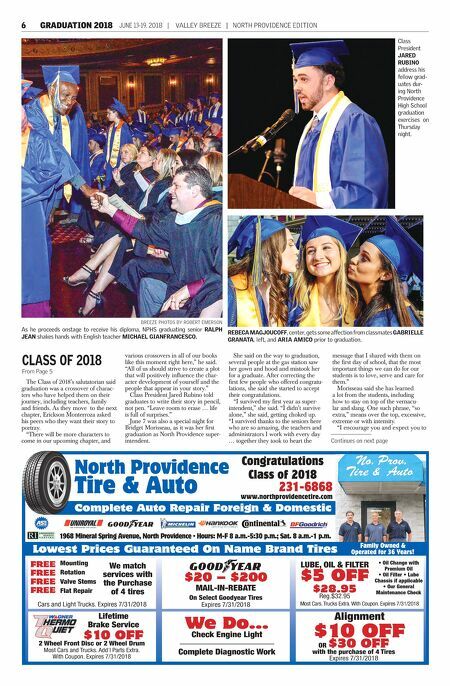 NORTH PROVIDENCE EDITION | VALLEY BREEZE | JUNE 13-19, 2018 GRADUATION 2018 7 be so extra. The difference between people who are average and highly successful: average people do what's expected. Highly successful people are extra. Extra respectful, extra kind, extra responsible, extra determined, extra loving, extra caring," she said. "So please, go out there and be so extra." She also advised graduates to practice the pause. "Life goes by fast enough. We're living in a fast-forward immediate gratification world. Practice the pause before judging others, criticizing and accusing. Pause when you're tired, angry and happy – and pause to enjoy a moment like this one." Mayor Charles Lombardi shared Morisseau's sentiments, saying, "This is a fast-changing world that you are entering – you can either fear it or you can prepare to take advantage of the changes and meet them head-on, and achieve whatever goals you seek for yourself." Lombardi said he could still remem- ber the excitement he felt when he walked that very stage 54 years ago. "You should feel a tremendous amount of satisfaction … be proud, your diploma is your reward for making good choices, for believing in yourself and your purpose. Look around … these are your future leaders. In the end, if you apply everything you've learned at North Providence High School, you will find yourself where you are supposed to be. You are our future, and we are all counting on you. Remember: once a Cougar, always a Cougar." School Committee Chairman Anthony Marciano offered his tradi- tional comic relief, which came when he explained the punch line to the joke he led his speech with. Getting down to business, Marciano said he feels particularly close to the Class of 2018, having participated in Student Government Day and other class activities. "A ceremony like this reinforces our knowledge that our young people are our greatest resource and our deepest wells of joy," he said. "I believe your future will be bright if you make the right choices." 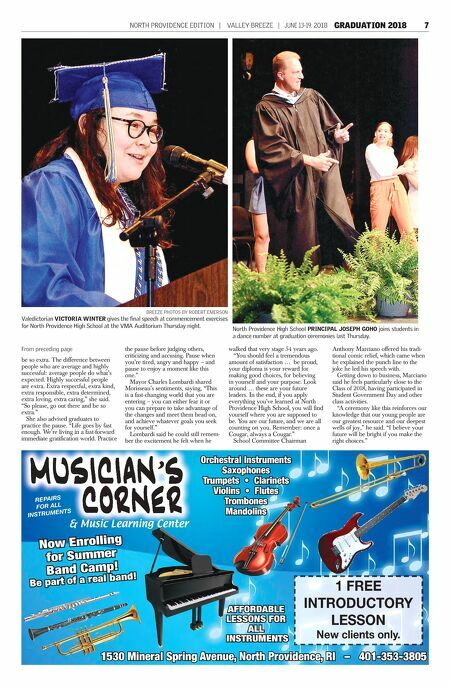 From preceding page BREEZE PHOTOS BY ROBERT EMERSON Valedictorian VICTORIA WINTER gives the final speech at commencement exercises for North Providence High School at the VMA Auditorium Thursday night. North Providence High School PRINCIPAL JOSEPH GOHO joins students in a dance number at graduation ceremonies last Thursday. REPAIRS FOR ALL INSTRUMENTS & Music Learning Center 1530 Mineral Spring Avenue, North Providence, RI – 401-353-3805 Orchestral Instruments Saxophones Trumpets • Clarinets Violins • Flutes Trombones Mandolins 1 FREE INTRODUCTORY LESSON New clients only. AFFORDABLE LESSONS FOR ALL INSTRUMENTS Now Enrolling for Summer Band Camp! Be part of a real band!